One point that we often come back to at How-To Geek is this: To take better pictures, you need to understand the manual control of the camera – even if you do not do this for every shot or shot. Your iPhone is no exception. Unfortunately, iOS does not provide manual controls in the default Camera app, so we'll have to opt for a third-party app. 1; things like Smart HDR and Portrait Mode. These are great, but do not replace manual controls. For example, if you want to take photos from the window of a moving vehicle, you need to set the shutter speed manually. The camera of your iPhone will almost always set it too slowly to avoid motion blur. Similarly, you may want to manually control your camera, at least temporarily, when photographing at night or in high contrast. The camera of my iPhone does its thing. Even if you mainly do this Let your iPhone do its thing – like me, to be honest – it's still important to know how to manually control things to take great pictures when you need them. Your iPhone does not give you full manual control over any setting. In particular, the aperture and the focal length of the lens are fixed at f / 1.8, and a frame corresponding to 26 mm (for the wide-angle lens) and 51 mm (for the telephoto lens). This means that you need to control the exposure with either shutter speed and ISO or with exposure compensation. You can also shoot RAW photos, giving you more options when editing your images. Okay, although I recommend VSCO, I do not recommend it unless you only occasionally use manual controls and do not want to pay for it. It's just the best free option out there. VSCO is an incredible editing app – it's one of my favorite photo apps – but the problem is that the camera part is just fine. You can make manual settings for shutter speed, ISO value, white balance, focus, and exposure compensation. However, they are not very intuitive to use. When you open the app, you will not be led directly to the camera, which means it's a bit slow. If you occasionally want to take a shot that requires you to manually control the camera settings, VSCO is great for you. However, if you regularly want to take control of your iPhone's camera, it probably annoys you. Halide is the best iPhone camera app. You have full control over shutter speed, ISO, white balance, focus, exposure compensation, and depth-of-field mode. All controls are quick and intuitive to use. 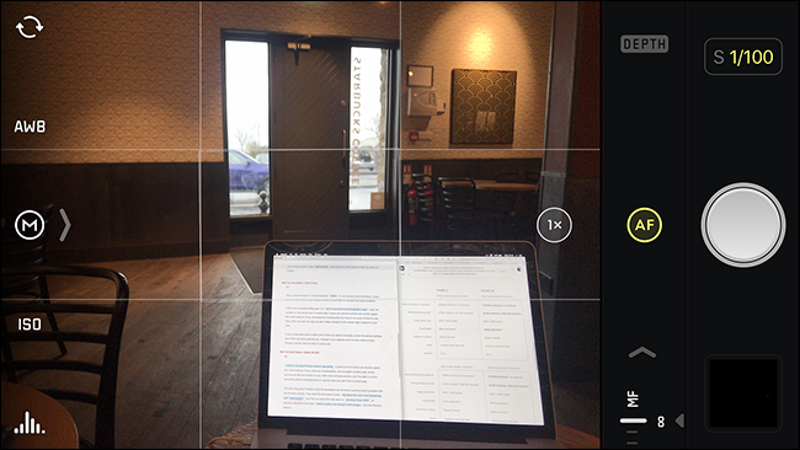 After a few minutes of practice, you can control everything without thinking about it – just what you expect from a camera app. The best thing about Halide is that the developers constantly explore the possibilities of the iPhone camera. They were the first to thoroughly explore what happened to "beautygate" and they used what they learned to develop Smart RAW, an exposure algorithm that requires better quality and sharper RAW images as the standard of the iPhone. Halide is the go-to app for many iPhone photographers for a reason. This is the best way to manually control your iPhone's camera.